Official campaigning got under way Thursday for the Sept. 30 Okinawa gubernatorial election, with the controversial plan to relocate a key U.S. military base within the southern island prefecture topping the agenda. 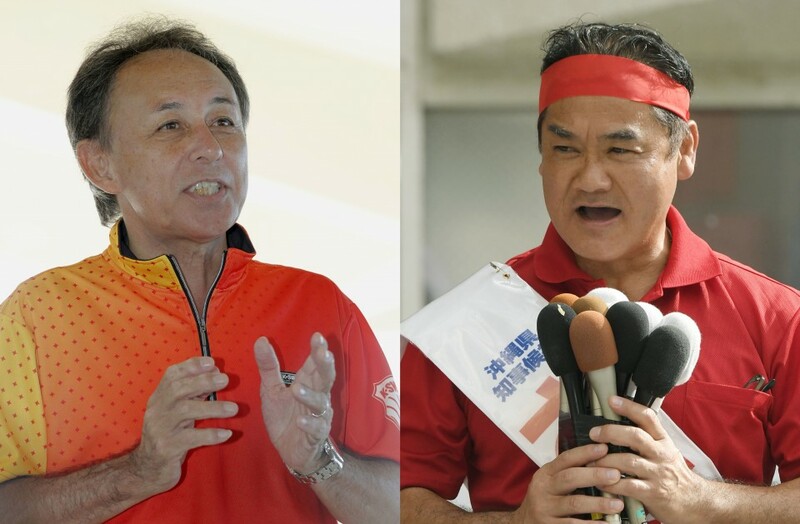 Atsushi Sakima, 54, the former Ginowan mayor backed by the ruling parties, and former opposition lawmaker Denny Tamaki, 58, are the main contenders for the post left vacant by the death last month due to pancreatic cancer of Takeshi Onaga, who was a staunch opponent of the relocation plan and fiercely confronted the central government. The outcome of the gubernatorial race could affect the future of the plan to move the U.S. Marine Corps Air Station Futenma from a crowded residential area of Ginowan to the less populated coastal district of Henoko in Nago, both in Okinawa. "Nothing will come out of confrontation and division. Through dialogue, I will convey the will of the Okinawa people to where it needs to be conveyed," Sakima said in Naha at the start of official campaigning. Sakima has secured support from the Liberal Democratic Party led by Prime Minister Shinzo Abe, who has been promoting the transfer of the base. The LDP's coalition partner the Komeito party and the opposition Japan Innovation Party also back him. "Only I can achieve everything, including the return of U.S. Marine Corps Air Station Futenma and the Naha military port," he said. Sakima is calling for the return of the land in Ginowan occupied by the base, which poses a danger to local residents, but has not clarified his stance on its transfer to Nago. Tamaki, a radio personality-turned-politician who served as a House of Representatives member of the opposition Liberal Party, has pledged to continue the policies of Onaga, enlisting support from other opposition forces including the Japanese Communist Party and the Social Democratic Party. "So far, I have worked to deliver Okinawa's voice to parliament with your support," Tamaki told his supporters in the village of Ie. "I will start my election campaign by carrying forward Mr. Onaga's desire to make Okinawa a prefecture that grows strongly," he said. Echoing Onaga's stance, Tamaki has expressed his opposition to the base relocation plan. 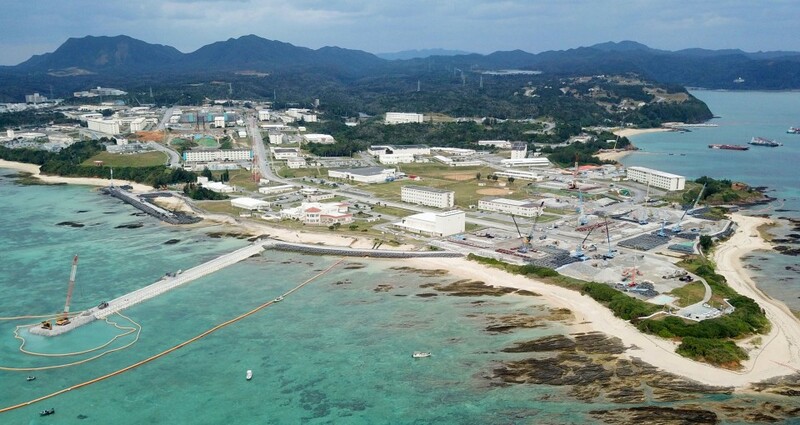 Many Okinawa residents want the base moved outside the prefecture due to crimes and accidents involving U.S. military personnel and base workers. Other candidates running for the seat are Hatsumi Toguchi, an 83-year-old former Naha city assembly member and an expert on local cuisine, and Shun Kaneshima, 40, a former internet technology firm employee who runs a restaurant. In line with an order given by Onaga in July, the prefectural government in late August retracted its approval for landfill work necessary for the relocation, claiming illegality in the application process and halting construction work of the Defense Ministry. In Sunday's Nago city assembly election, candidates opposed to the relocation plan managed to retain a majority. According to local political sources, Onaga recorded a voice message shortly before his death designating Tamaki and local businessman Morimasa Goya as his possible successors, but the message has not been made public. After that, Tamaki decided to run for the election, while Goya has expressed support for Tamaki.